What do the black and red scenes mean? What do they mean? Is there any difference between "Red Scene" and "Black Scene" and why are they used? 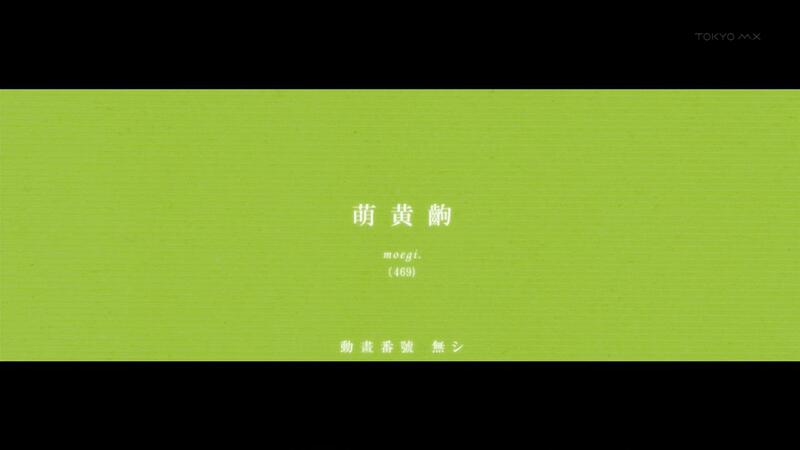 Ah, the Monogatari [color] Scenes. Before we talk about what they mean, let's look at some of them. Note: this collection is not exhaustive - I haven't gotten around to taking screencaps for most of Bake, or for any of Neko Black or Neko White. So, what do they mean? They aren't present in the light novel series (which isn't surprising - this wouldn't really make sense in running text), so we can't turn to that for information. 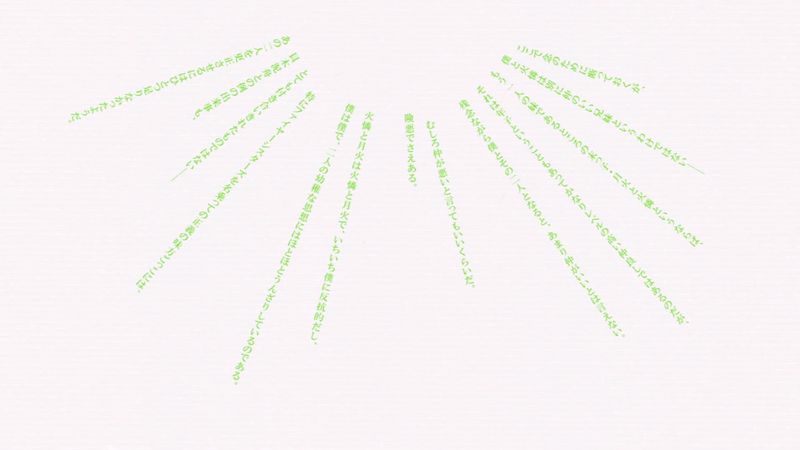 And unlike all of the text-heavy 2~3-frame screens that Monogatari is so fond of (cf. 1, 2, 3), these screens aren't really being used to compress a lot of information into a small amount of time, either. Instead, I think it behooves us to examine what is going through Araragi's head (at least for arcs in which he is the narrator) to understand why these scenes appear. Let's look at Red Scenes first. The first one is at Bakemonogatari ep01 at 01:49, when Araragi, late for school, is rushing up that huge spiral staircase, right as he first glimpses Senjougahara falling. That's the only one in this episode. 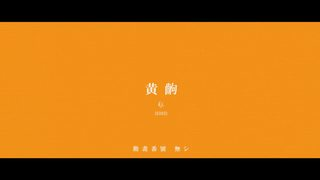 We find a lot more in Nisemonogatari ep11 - when Araragi talks about how he'd die over and over for his sisters; when he first tries to attack Kagenui (while yelling about how having an non-blood-related sister is super-moe); an four times when Kagenui hits him. In Second Season ep09 (Kabuki ep03), we get another Red Scene when Araragi yells at Oshino (not present) for having given jiangshi-timeline him a different talisman. There's also one when Araragi realizes he must have been killed by Black Hanekawa in that timeline. At the end of the episode, when the realize they're surrounded by jiangshi, there's one more Red Scene. In Second Season ep10 (Kabuki ep03), there's a Red Scene when jiangshi-timeline Kiss-shot appears, and one shortly after that when Araragi is terrified by the way Kiss-shot laughs. Now, let's look at Black Scenes. The first appearance of Black Scene occurs at 02:02 of Bakemonogatari ep01, when Araragi notices Senjougahara falling, stops in his tracks, and blinks. We see another Black Scene at 02:05, and again at 02:06 (this time accompanied by that "shutter" sound). After that, we don't see too many Black Scenes in that episode - one when Senjougahara staples him, one a bit after he tells Senjougahara to give him her stationery, and one right after they walk into the ruined cram school. In general, you see Black Scenes fairly often, typically accompanied by a change in "gaze" - that is, Araragi's focus shifts to a different part of a given scene. It is worth noting that (to the best of my recollection), Black Scenes never separate different scenes. Based on this evidence, a common inference is that Red or Black Scenes correspond to Araragi blinking. 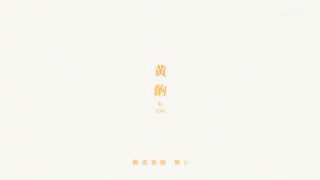 Since the Monogatari series is largely told in the first person (albeit that person is not always Araragi), the idea is that we see what he sees - when he blinks, we see nothing but darkness, since he sees nothing but darkness. This isn't strictly the case (because, of course, Araragi's eyes aren't always the camera), but it generally seems like a good perspective to adopt. In this framework, then, Black Scenes are just what happens when Araragi blinks (sometimes). What about the Red Scenes, then? Well, pay attention to the fact that they seem to appear when Araragi is excited or under stress or in danger or angry, or whatnot. In other words, we see Red Scene when Araragi blinks while he is under the influence of some strong emotion. So, in that sense, Red Scene is just a particular type of Black Scene. Red and Black Scenes seem to serve the same purpose even in parts not narrated by Araragi. In Second Season ep12 (Otori ep01), narrated by Nadeko, we see Black Scenes in the first five minutes mostly corresponding to Araragi blinking (with an especially nice one at 04:29). Once we move back to the "present" from the initial flash-forward, we get a number of Black Scenes corresponding to Nadeko blinking. We also get a Red Scene at 12:04 when she first sees the medusa, startling her, and again at 19:35 when the medusa presents her with an exaggerated version of the horrific things she did to the snakes at the shrine. There doesn't seem to be much of a difference between Red Scenes for Nadeko vs. for Araragi. What about the other [color] Scenes? It's difficult to generalize about these since they're so rare. Let me just identify a few examples (from Nise and Kabuki, since those are the only parts I have a full screencap collection of) and put up a few hypotheses. There are two Yellow Scenes in Nisemonogatari - one in ep10 at 17:32, when Shinobu says something, and one in ep11 at 12:05 while Kagenui is talking (at the beginning of her fight with Araragi). 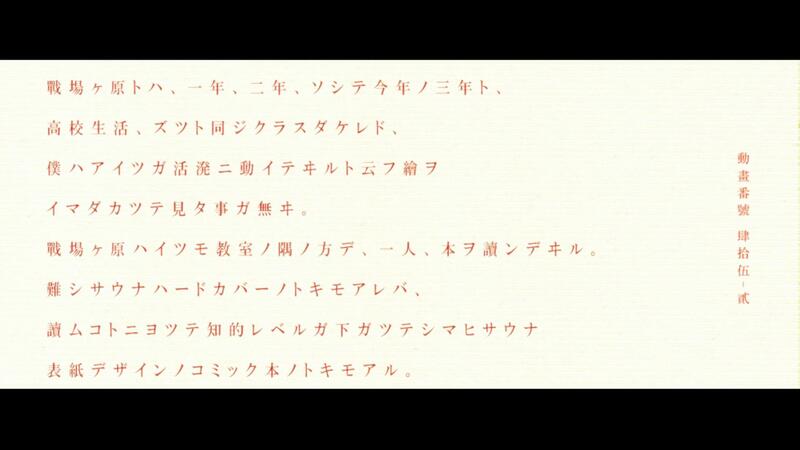 There's also one in Second Season ep08 (Kabuki ep02) during a narration about Hachikuji by Araragi. I'm not seeing any common features here. 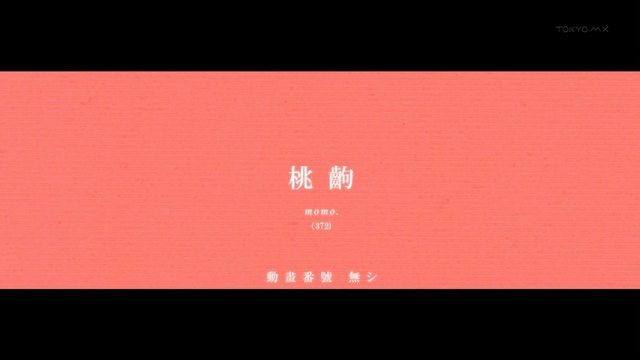 There are three White Scenes in Nisemonogatari - one in ep03 at 22:37, when Senjougahara says that Hanekawa called her (this one has cat ears in it); one in ep09 at 22:37 during some throwaway line to Hachikuji; and one in ep11 at 06:00 during a conversation between Koyomi and Tsukihi (right before she says "platinum mad"). In Second Season ep08 (Kabuki ep02), there's one at 16:20, right when Araragi is molesting still-alive Hachikuji in the past. 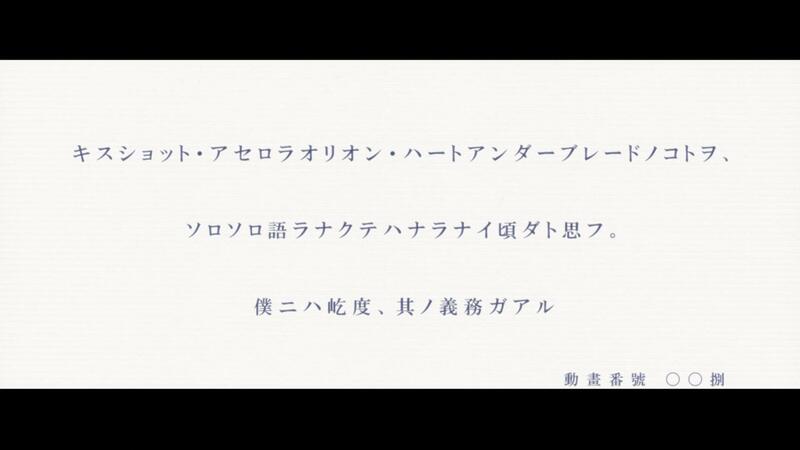 There's also a White Scene in Second Season ep12 (Otori ep01) right after a shot of the medusa. Here, we do have Hanekawa being "white" (as we learn much about in Neko White), "platinum" being generally "white", and the medusa is "white", too, I guess. I'm not sure how the Hachikuji ones fits in, though. There are Peach Scenes at 01:53 in Second Season ep08 (Kabuki ep02), when Shinobu is excited to see mini-Araragi; and another one at 21:52 in Second Season ep12 (Otori ep01), when Nadeko agrees to do the medusa a favor. There are Lilac Scenes at 12:41 in Second Season ep08 (Kabuki ep02), when Araragi responds to Shinobu's question about whether or not he understands what saving Hachikuji means for her; and at 11:05 in Second Season ep12 (Otori ep01), during Nadeko's conversation with Ougi. No idea what the deal is with these two. There's a Purple Scene at 02:03 in Second Season ep19 (Oni ep03) shortly after Ononoki walks in on Araragi and Shinobu's conversation. There's another one (accompanied by a "popping" sound) at 11:40 in Second Season ep19 (Oni ep03) just before Araragi starts feeling Hachikuji up while she's asleep. Why are they there? Beats me. Summary: aside from Red and Black, the other [color] Scenes don't really seem to have much in the way of consistency. They see very little use, especially in Bakemonogatari. 1 The moe in moegi is the same word as the moe that serves as the origin of the otaku-jargon word "moe" meaning cute/etc. Basically this anime heavily focuses on the so called character lenses. This term means in general that the whole story is viewed from the eye of one single character. Now, the Studio Shaft took this to another level, making us literally viewing it from their eyes. In real life, when we see our environment, we start blinking. During the blinking, we see a "black frame" or "red frame" depending on the light. The scene when Kanbaru beats with the devils arm the crap out of Araragi. The background and blood color constantly changes, showing us the pain and surrealism the MC (main character) has to deal with. Notice it all disappears when Gahara suddenly enters the room, forcibly pulling his attention back to reality. The scene when he phones to Hanekawa (I think also in Suruga monkey arc). The thing here is, that he only hears her voices. If you are wondering how suddenly she got surrounded by cars, well it is simply because she was walking down a street with lots of cars passing by. The reason why every single car, every single bike looks exactly the same. To understand this, let's take another look at Araragi's personal bike. For him this one bike is special, therefore it has its own design, unique in the whole anime (you won't see any other mountain bike in the whole anime). He doesn't care about things which don't belong to him. This is why everything not special to him, like other bikes, other cars, other houses, Kanbaru's ero books, looks all the same to him (though the last item might be a different reason). The focus on some female body parts it is because Araragi as the character whom we see is a teenager. All teenage boys are somewhat affected by female body parts. Not the answer you're looking for? Browse other questions tagged monogatari-series or ask your own question. What is the purpose of the fast appearing screens? How did Araragi hide yoto “Kokoro-Watari” inside his body? 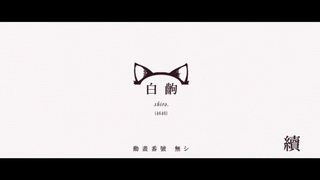 What is the original text of Black Hanekawa's tongue twister? What do the parenthesized numbers in the [color] Scenes mean? How are people supposed to read and understand these part-second text frame scenes? Why does Kaiki keep changing shirts? What's the basis for the gender of Black Hanekawa as reported on the wikia? What exactly is the relationship between Araragi and Shinobu? Are parodied scenes in the Monogatari anime described in the light novel? What do Karen and Tsukihi see Ononoki as?